For the last century, Labor Day events have served primarily as occasions for politicians to make their pitches. 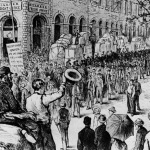 But at the height of the Gilded Age, Labor Day was a clarion call to all citizens. On September 7, I’ll be presenting a reading from my new book on the West Virginia mine wars, The Devil Is Here in These Hills, at Porter Square Books in Cambridge, MA. The store events manager has asked me to compile a Labor Day list of the twenty best books on workers and unions, books that would appeal to the general reader.